How far we've come. Back in the campaign days, Donald Trump said there would be a "big beautiful wall" stretching along the southern border from Texas to California and Mexico would pay for it. What — they say no way? "The wall just got 10 feet taller," Trump boasted. When Trump shut down the government for 35 days in December and January, he was asking for $5.7 billion. Last year, when Republicans still controlled both houses of Congress, a plan was floated to give Trump $25 billion for the wall in exchange for more forgiving policies toward immigrants already here illegally. Trump denounced it as a "giant amnesty" that also failed to make legal immigration more restrictive. As he addressed a rally in El Paso Monday night, Trump said he hadn't been briefed on what the Capitol Hill bargainers want to present him. He could reject it. But what then? Another shutdown? He can't blame just the Democrats for a bipartisan plan. Declare a national emergency or raid unspent disaster-recovery funds from California and Puerto Rico. The courts could say no. But the right-wing commentators who goaded Trump to choose a shutdown over a stopgap government spending bill in December will be in his ear to reject what Fox News' Sean Hannity has already called a "garbage compromise." "Just so you know, we’re building the wall anyway," Trump told the Texas crowd. Someday, he will have to either put up or ... something. For more, see Newsday's story by Laura Figueroa Hernandez. Measles outbreaks among unvaccinated clusters of kids in New York and elsewhere are gaining attention, but not from Trump's Twitter, writes Newsday's Dan Janison. Before he became president, Trump echoed the frightful canards of anti-vaxxers. "Healthy young child goes to doctor, gets pumped with massive shot of many vaccines, doesn't feel good and changes — AUTISM. Many such cases!" said a tweet from March 2014. Trump had other medical opinions back then too. In October 2014, he helped spread unwarranted panic about Ebola when afflicted U.S. medical personnel were brought home for treatment. But now, he stands back and says nothing. The Trump-picked leader of the Centers for Disease Control is encouraging parents to get their kids the vaccine, calling it "very safe and effective." Gov. Andrew M. Cuomo said he will make a case to Trump in an Oval Office meeting Tuesday to reconsider the provisions in the 2017 tax overhaul plan that capped deductions for state and local taxes, Newsday's Michael Gormley reports. Higher income New Yorkers are facing a tax shock starting with their 2018 federal returns because they can no longer offset part of what they pay in state and local income and property taxes. To me, there is no more vital, long-term issue for this state than SALT,” Cuomo said Monday. A week ago, Cuomo blamed the SALT provision and Trump for a $2.3 billion hole in state income tax revenues for December alone. Cuomo said the loss in estimated income tax payments by high-income earners indicates that many top earners may be leaving the state. Last week, Trump said he was open to discussing changes but provided no specifics. Trump's clock on de Blasio time? The Washington Post analyzed the internal Trump schedules that were recently leaked to Axios and deduced that his workday usually doesn't seem to start until 11 a.m. That's unusual for a modern-day president, but seems to put him in the same work time zone as New York City Mayor Bill de Blasio. Not that their midmorning routines match up otherwise. De Blasio works out around three days a week in the gym at the Park Slope YMCA. Trump prefers lower-impact exercise ("I walk, I this, I that . . . I run over to a building next door.") An earlier riser, the president uses the mornings to keep his fingers in shape operating the TV remote and his phone. Not only is Sen. Kamala Harris, a Democratic 2020 contender, for legalization of marijuana. She's quite enthusiastic about it. "Listen, I think it gives a lot of people joy and we need more joy in this world.” the California senator said on “The Breakfast Club” radio show . Personally, she smoked weed a “long time ago,” but Harris wouldn't say if she'd partake again if she was in a place where it's legal, reports New York Magazine. A Floral Park woman has gone to court claiming Trump's now defunct mortgage company, where she worked, still owes her nearly $300,000 she says a judge ordered them to pay her a decade ago, Newsday's Rachelle Blidner reports. Jennifer McGovern said the figure includes commissions, legal costs and interest as of February 2009. In a rebuke to Trump, Gov. Gavin Newsom is pulling out most of the Calfornia National Guard troops deployed at the Mexican border. A similar decision was announced last week by New Mexico Gov. Michelle Lujan Grisham. Both are Democrats. 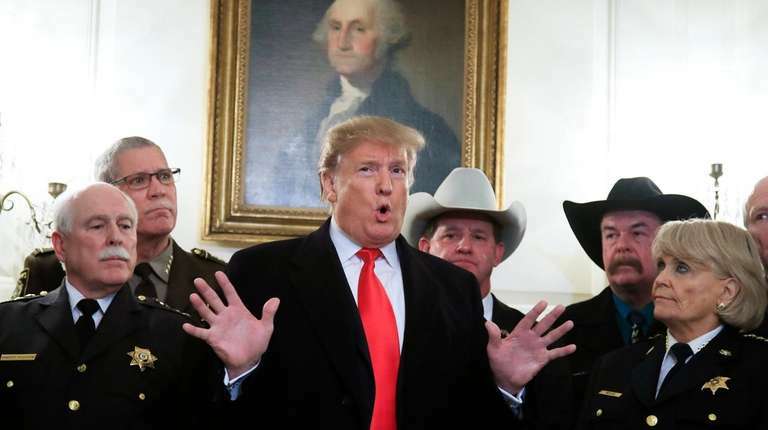 Trump scored a legal win as a federal appeals court in California said the administration has the authority to replace 17 miles of border fencing and construct a wall prototype without environmental and public reviews. For a Democrat, Minnesota senator and 2020 contender Amy Klobchar is unusually popular with her Republican Senate colleagues, Politico reports. “I like her a lot and hope that’s not harmful to her,” said Sen. Roy Blunt (R-Mo. ), who runs the Rules Committee with her. Lawyers for the Trump Foundation and the Trump family, fighting a New York State lawsuit, argued in court papers that state Attorney General Letitia James "ran on an anti-Trump campaign" and is biased against them. The suit was brought last June by James' predecessor, Barbara Underwood.